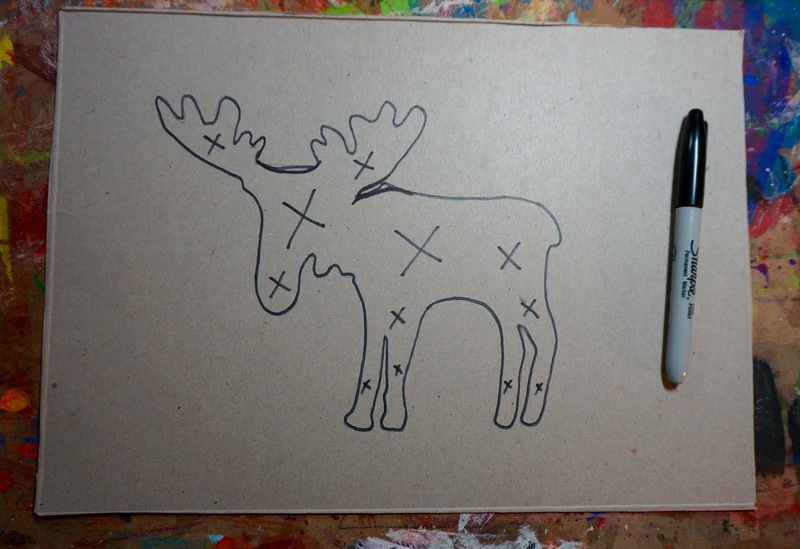 I thought I'd take our moose from Monday and do a stencil project. It also goes nicely with this week's giveaway. This is Margaret Peot's new book, Stencil Craft. 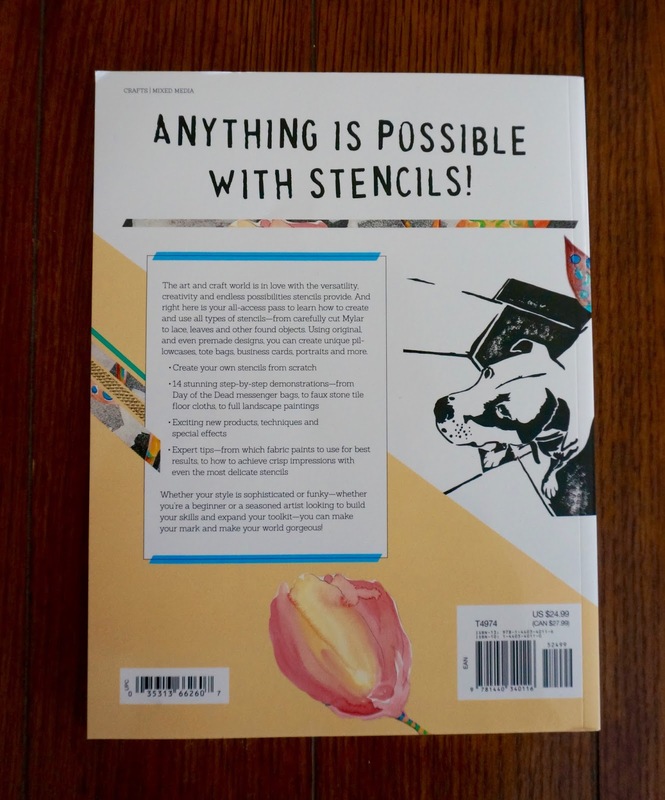 and for those of you who have been stencilling for awhile it has some new ideas. 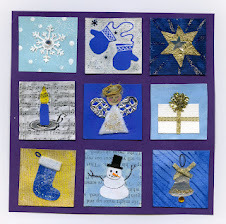 I especially like this amalgam composition idea. 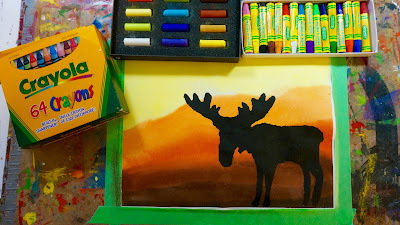 Using multiple stencils to build a scene. I will be using this in future projects. 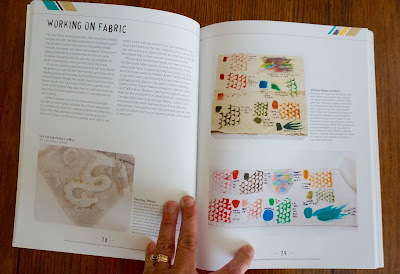 I also appreciated all the info for stencilling on fabric, something I would like to incorporate more in my textile projects. I will make the draw on Sunday Aug 23rd/15. Canadian or U.S. residents only please. 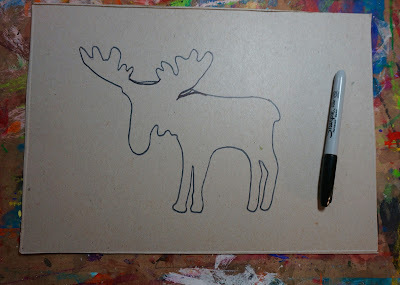 First we have to create our stencil. I use a very low tech method. 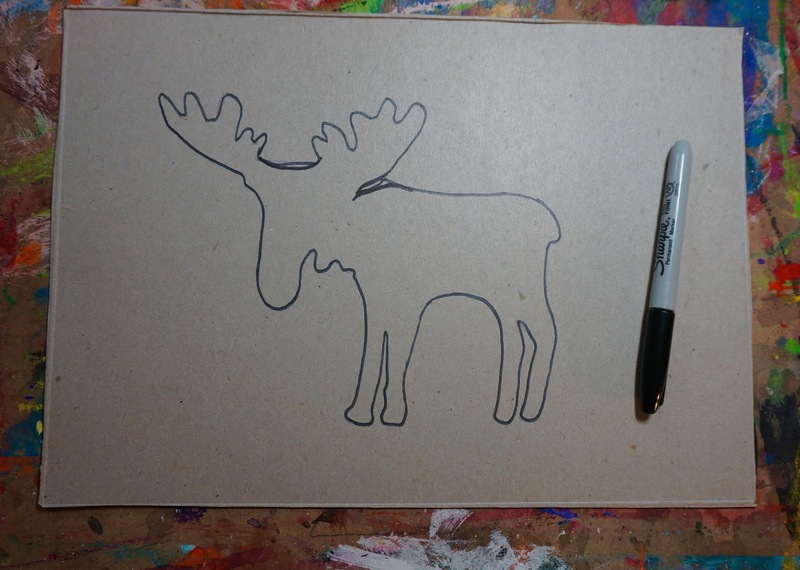 I take a piece of cereal box weight cardboard and draw or trace out my image. 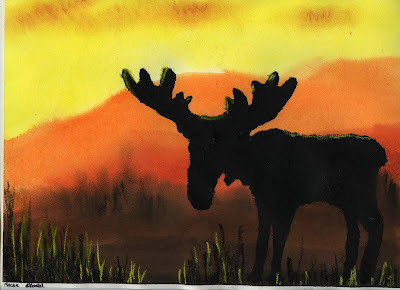 Here I took my moose template, traced around it and altered some of the areas to make a nicer silhouette. You want to have lots of room around your image, more on that later. 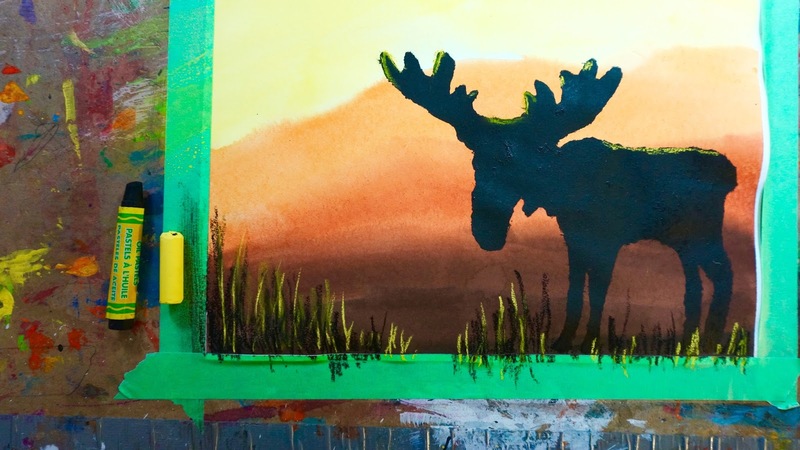 At school I spend a bit of time explaining that we want to keep the negative space, we don't care about the moose itself. It's hard to make that shift when kids are used to just cutting out the image. To help I get them to put X's on the area we don't want. 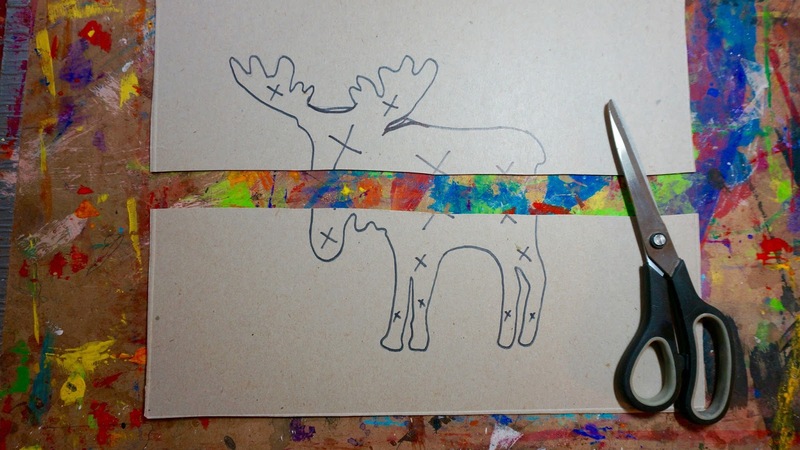 A stencil doesn't have to be pretty, it's just a tool so why not make it easy on yourself........cut the image in half. and just tape it back together. Paint your background. I'm using disk tempera on a 90 lb wc paper. For stencilling I want a nice round brush and a thick paint. 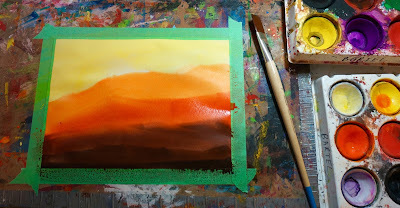 I prefer acrylic but you can also use liquid tempera. 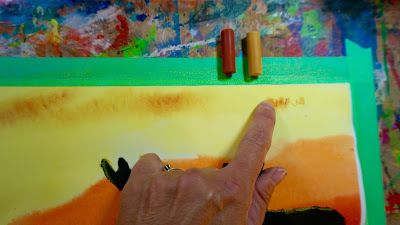 Acrylic tends to be more opaque so you get a better result. You need to hold the stencil firmly in place. You don't want it to shift. At school I get the kids to work in pairs. One holds the stencil and one pounces on the paint. You can see now that it helps to have extra space around the stencil. 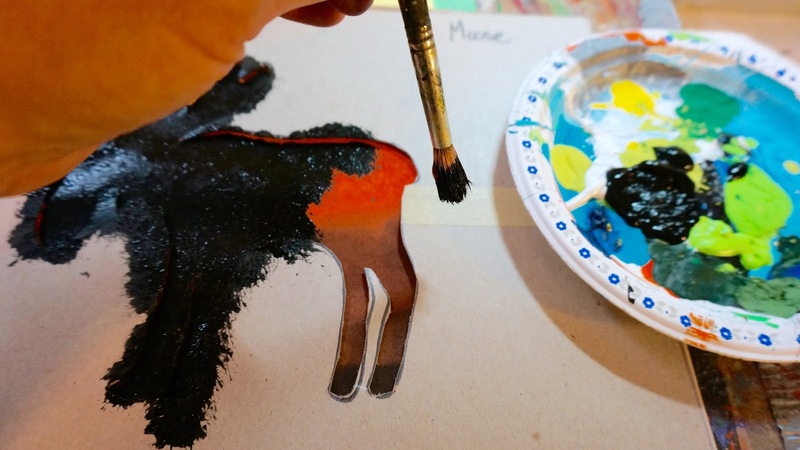 When applying the paint you want to pounce the brush straight up and down. You don't want to stroke side to side as the paint will get under the stencil. Lift the stencil off in one lift straight up. I tell the kids to use both hands, lift up and then put it to the side. 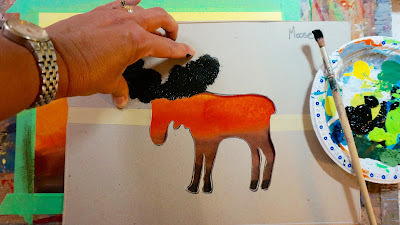 If you are re-using the stencil again wipe away the excess paint. 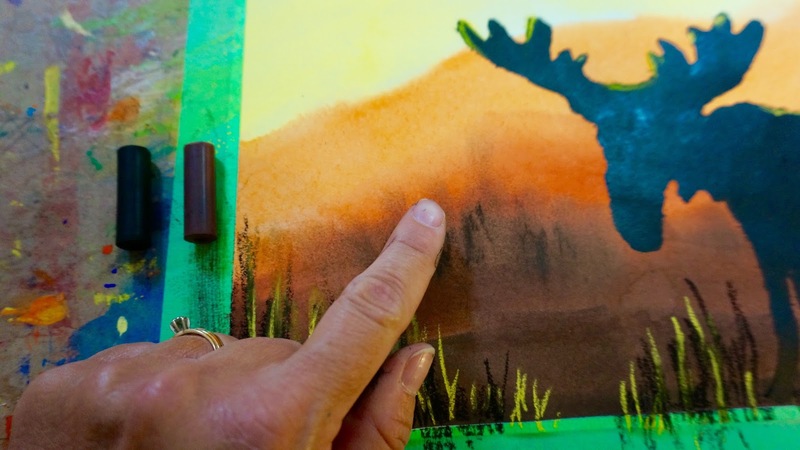 You want the side touching the background to be dry so you don't accidentally transfer any paint. When the paint has dried we want to add some extra touches to take it further. You can use chalk pastel, oil pastel, or even crayons. Add some grass. The yellow is the reflected light. I also added yellow to the tips of the antlers and the back of the moose, areas I think would be reflecting that brilliant sunset. I want a few clouds in the sky so I smudge in some reddish brown. 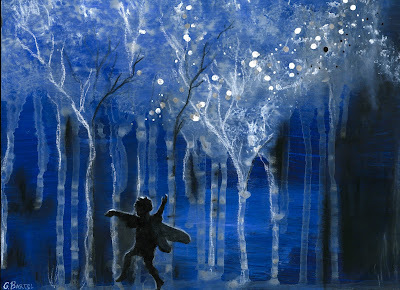 I also smudged some dark distant trees into the landscape. That's it. Gotta love a stencil project. Be sure to enter the draw and give a stencils a try. You never know what magic may occur. 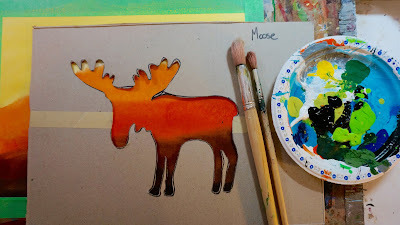 Love the moose - you always provide the best tutorials! Thanks for the giveaway opportunity! What a great project. 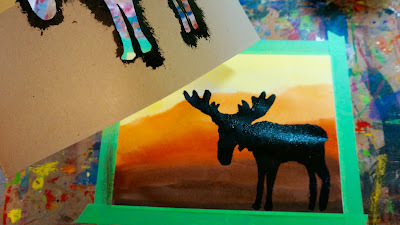 I use stencils mostly on the gelli plate - still have an addiction to that! 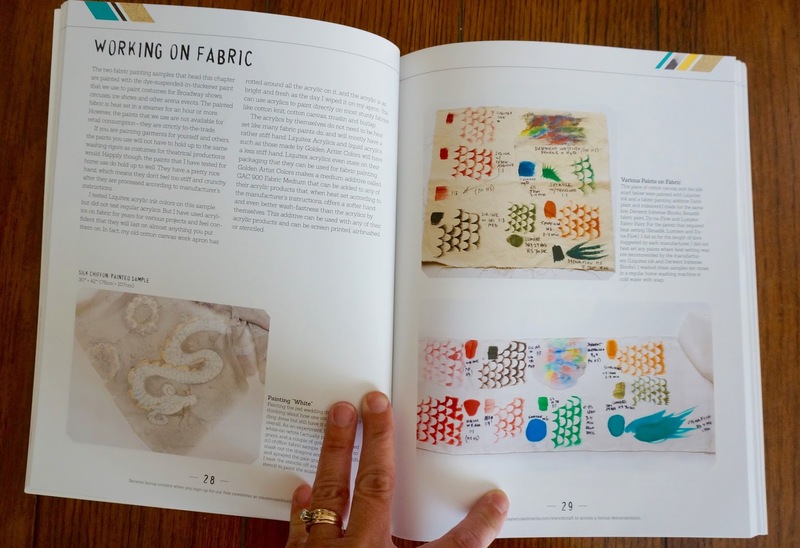 Looks like a wonderful book - and giveaway! In the past I stenciled a bit on the walls of our house. 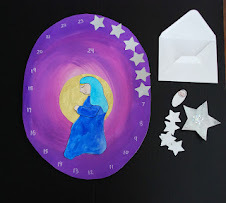 try some projects at school with my second graders. I am ready to try it myself. You explain things so clear and I have tried so many things I wouldn't have because you have stirred the curiosity in me. Thanks for the giveaway! 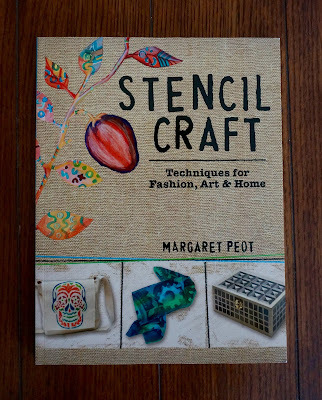 Would love to learn new stencilling options from that book. Your explanation of making a stencil is really great and easy to understand, I am going to try it. 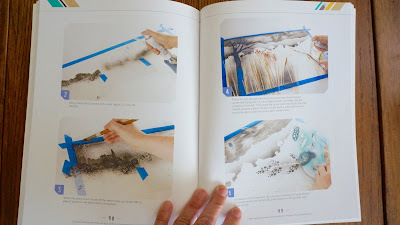 The book will be a great guide as I really learn how to use my stencils correctly. 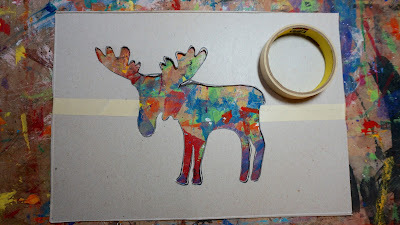 I've always gotten stuck with cutting out stencils. THANK You so much! Your tutorial helps a lot. 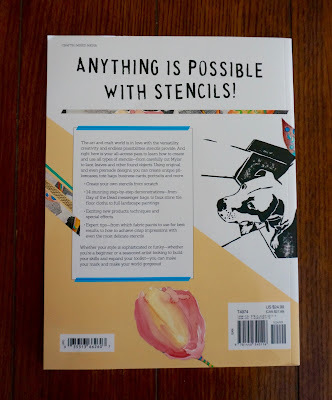 I never thought of using stencils. The book would be a big help in my classroom. Thanks you for the giveaway. I love the fairy...what a magical background you created! The moose is great as well. 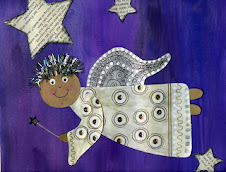 I love stencils...so many possibilities! This looks like so much fun! 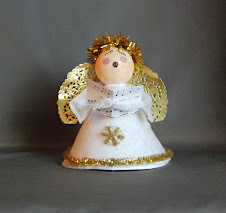 Would love to use it with my homeschoolers. Thank you for this opportunity! 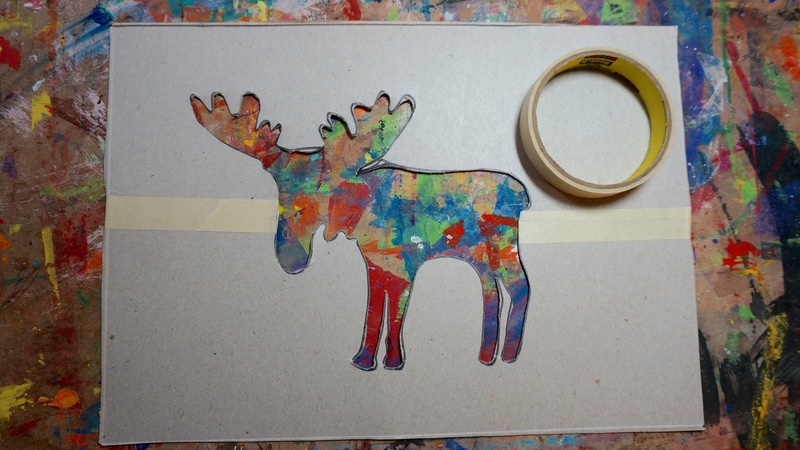 I love the idea of using stencils to create art! I use so many of your projects in my class (did Canadian landscape inchies with my ones and twos in June). Thanks for the great instructions and tips on stenciling. I'm looking forward to doing it soon. 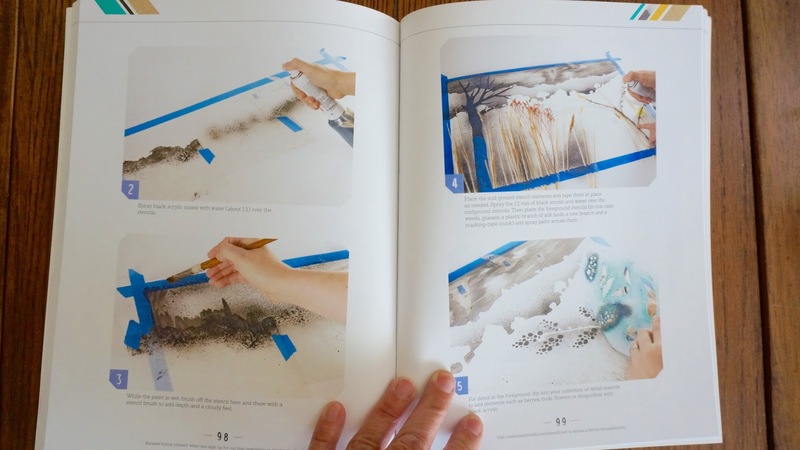 The book looks terrific!